Note that BESA Research can also work with MEG. Most of the functions described for EEG are also valid for the processing of MEG signals. The review window is the main window in BESA Research. It provides access to all important review and analysis features with one or two mouse clicks. The main features are illustrated in the layout figure below. 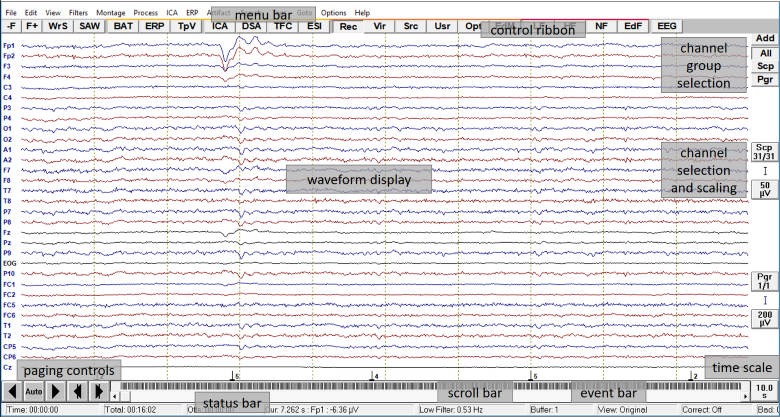 The central part of the window shows the EEG waveforms of the current montage. Around the central display, the menu bar and buttons are grouped for an easy access to the program features. The menu bar is situated at the top of the window. All commands can be selected from one of the submenus which open when you click on one of the headings. Each heading summarizes a set of features for a specific aspect, e.g. artifact correction. All menu items and sub-items are explained in section Menus and in online help chapter "Review / Reference / Menus". The push button controls below the menu bar allow for a fast selection of commands and settings which are often used. They are grouped in sections which feature file manipulation, mapping display, data analysis, remontaging, and filtering. The functions of the push buttons in the control ribbon are explained below and in online help chapter "Review / Reference / Menus". The controls at the top right of the waveforms display enable showing or hiding channels which belong to a specific channel group. These can be scalp, polygraphic, or intracranial channels. Additional channels can be chosen for display below the current montage, e.g. EKG channels and/or virtual eye electrodes that are automatically calculated. For each selected channel group, e.g. Scp, Pgr etc., two push buttons and a scaling symbol are available on the righthand side of the window. By means of these buttons, a subset of channels can be selected for display, and the scaling of the channel group can be adjusted. For additional channels (the blue channels at the bottom of the display), the scaling can be adjusted individually. The timing push button at the bottom right of the window adjusts the time resolution of the data segment which is displayed on the screen. The event bar at the bottom of the waveforms display summarizes the position of events within the data file. By clicking on an event, you can jump to the corresponding position in the data. By using the scroll bar which is situated just below the event bar, you can quickly move through the data file - either by clicking into the scroll bar, by dragging the scroll button, or by using the arrows for small adjustments. The status bar at the very bottom of the window provides information about the current settings. The information displayed depends on the context, e.g. on whether a cursor is set or not, or whether an average buffer or raw data are viewed. These push buttons are placed at the bottom left of the window. They enable fast forward and backward paging, either by using the arrows at the left for a whole page, or by using the arrows at the right for a half page. The Auto button is used for automatic paging and searching / averaging. For more details about controls and push buttons see online help chapter "Review / Reference / Controls". Easy to use mouse operations facilitate working with data files. You can mark specific items by a single click, initiate a map by a double click, or use a right click to open context-optimized menus. The figure below illustrates the main mouse functions. 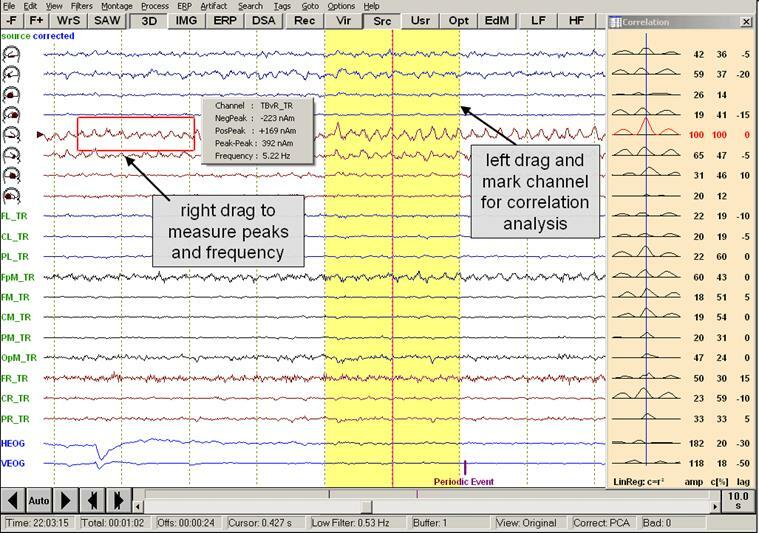 In this example (EEG2.eeg), right temporal-basal seizure onset is shown using the source montage TR_Temporal Region. An automatic eye artifact correction was performed that added two virtual EEG channels for vertical and horizontal eye movements below the montage channels (more information on artifact correction is found in the chapter "Artifact Correction"). The source montage displays the signals from four aspects of the left and right temporal lobes (head symbols: basal, polar, antero-lateral, postero-lateral aspects) and 11 other brain regions (more information on remontaging is found in the chapter "Montage Editor"). Basic mouse functions in the review window. In source montages, a click on the channel label (or head symbol) at the left of the display opens an image which shows the brain region corresponding to the source channel. Learn more about images in the chapter “Mapping”. In the original montage, the right click on the channel label opens a popup menu to define a channel as bad, or to interpolate its signal using the other channels. Left mouse double click: Opens the mapping window and shows the voltage topography at the selected position. Maps can be displayed either as 2D or 3D whole head maps, or as top meridian projection maps. For more details see the chapter “Mapping”. Left mouse click: Remove cursor and maps or images, if displayed. 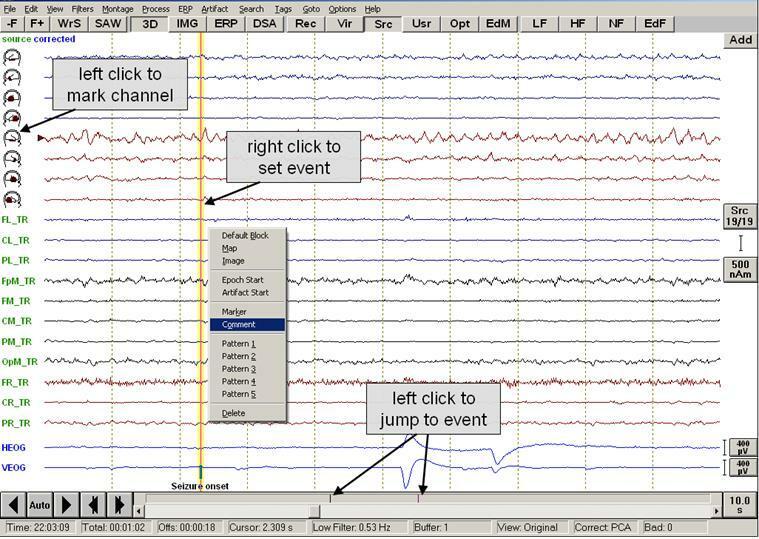 Right mouse click: Opens a popup menu for marking, adding or deleting events and to start specific processes related to the selected position in the EEG. In the example shown here, a comment was added to indicate seizure onset. Left mouse drag: Mark a block for analysis, e.g. FFT or correlation analysis. Right click into the marked block to obtain the special popup menu for processing of marked data blocks. Right mouse drag: Measure peaks and frequency of marked channels segment (cf. figure below). Left mouse click: Jump to events. Right mouse click: Display information about events. Left mouse click: Use button. Right mouse click: Display information on use of button. Mouse drag functions in the review window. The example above illustrates how amplitude peaks and frequencies can be measured using the right mouse drag, and how a block can be marked using the left mouse drag, e.g. for correlation analysis. Please refer to the sections “Measuring Peaks and Frequency” and "Correlation" for detailed explanations. Paging through the EEG with BESA Research has several advantages over paging through paper EEG. For example, the default setting in BESA Research is paging with a 10% overlap, which ensures that events at the edge of a page are not overlooked. Larger or smaller paging steps are achieved by just two mouse clicks. You can also jump to any part of the EEG recording by a click into the event bar, switch among various montages using the push buttons, etc. The arrows page forward or backward by a whole page. If Paging with Overlap is selected in the program options, paging occurs with a 10% overlap (maximum 1 second). To page through the display automatically, click on the automatic button between the arrow buttons. Then click on the page forward or page backward button, or press the <Space> bar on the keyboard to start paging. Automatic paging may be stopped by clicking the Auto button again, or by pressing the <Space> bar or any key on the keyboard. You can speed up or slow down automatic paging using the menu Options / Paging / Timing of Auto-Page Mode. The arrows at the right are used for paging half a page forward or backward. Press the arrows on the scrollbar at the bottom of the window (cf. figure below) to step forward or backward by just one second. Clicking into the scrollbar area pages forward or backward in whole page steps (this is also achieved by using the mouse wheel). These controls are described in more detail in online help chapter "Review / Reference / Menus / Paging Controls". A useful and efficient way to work with BESA Research is to keep the left hand on the keyboard and the right hand on the mouse (see the figure below). You can page through the EEG using the <Space> bar (left hand). Stop paging by pressing the <Space> bar again and press the 'B' key to page back in half page steps, for example, until you see the pattern that made you stop paging. Use the right hand on the mouse to work on the displayed signals, e.g. view maps (left mouse double click), set tags or define epochs and artifacts (right click for popup menu), and perform FFT or linear correlation (drag to mark block and right click for popup menu), etc. To move back by a half page (useful e.g. if a pattern was detected during automatic paging), press the 'B' key. Move forward by a half page with the 'N' key. For detailed information on additional keyboard paging commands, please refer to online help Chapter "Reference / Controls / Mouse and Keyboard / Keyboard Controls". Tagging of the EEG is like making notes on an EEG-printout. Tagged events in a digital EEG are more powerful, since they can be used, for example, for selected viewing of a group of similar events (see online help chapter "Review / Reference / Menus / View / Selected View"). Tags of different kinds can be used to mark time points or ranges of interest, add comments, and define artifact time ranges. All types of tag can be set using the popup menu that appears when the right mouse button is pressed. Markers. These define time points that are used to divide the EEG into gross time ranges, for functions such as: FFT or average between markers. Comments. These are text notes that can be placed at any time point in the EEG. Epochs. Time ranges of interest with optional labels. These can be selectively viewed excluding all the remaining EEG. This allows for a fast overview over similar epochs. Artifacts. Time ranges containing artifacts. These are similar to epochs, with the additional property that they are excluded from averaging and FFT. Patterns. These define time points in one of five categories (Pattern 1-5). They may be used for averaging in 5 different buffers and can be defined by the pattern search. Triggers. These are defined by an external trigger input or are created from recorded channels by converting pattern tags into triggers from the ERP menu (see help chapter "ERP / Functions... / Managing Triggers / Editing Triggers"). The event bar is located at the bottom of the review window. It shows all events in the data file as vertical lines. Different event types are indicated by different colors. You can view an event description by right click on the corresponding line. Jump to any event by left click on the line. Most tags are defined at single time points by moving the mouse pointer over the position in the waveforms display, performing a right click, and selecting the tag type from the menu that appears. Epochs and artifacts are defined when a block has been marked by dragging over a portion of the EEG and pressing the right mouse button. Left and right borders of an epoch/artifact can also be defined at single times by pressing the right mouse button and selecting epoch or artifact. You can page and terminate the pending epoch/artifact by right clicking at another time to mark longer segments. Popup menu after right click somewhere in the EEG. Right click on the vertical line in the event bar which represents the event. Jump to the position of the event in the data file by a left click in the event bar (or by using the Goto menu). The event is indicated in the waveform display by a vertical line. Right click into the display just above the event bar with the mouse positioned at the latency of the event. Remontaging in BESA Research is conveniently performed by pressing one of the push buttons Rec, Vir, Src or Usr, which provide a shortcut to the Recorded, Virtual, Source and User-Defined submenus of the Montage menu. The push buttons Opt and EdM allow for setting montage options and editing of user-defined and additional montages. Original EEG data: Original Recording. Average reference montages: Average Reference, Original Average Reference. Longitudinal/horizontal bipolar montages: Double Banana, Triple Banana, Horizontal Bipolar. Montages with a single channel reference: A1/A2 Reference, Referential. Average reference montage: 10-10 Average. Combined (=averaged) ears reference: Combined Ears. Reference-free montage: Reference Free, Reference Free (10-10). Current source density montage: CSD-Laplacian, CSD-Laplacian (10-10). Standard brain source montages. See below for further explanation. Specific user-defined montages created in the Montage Editor or the Source Analysis window. See below for further explanation. left to right depicting lower left, intermediate left, midline, intermediate right and lower right rows of channels with a sequence from anterior to posterior. right to left depicting lower right, intermediate right, midline, intermediate left and lower left rows of channels with a sequence from anterior to posterior. Additionally, montages can be grouped by hemisphere for easier hemispheric comparison or by regions for easier regional comparison. This allows for convenient comparison of lateralization and location of focal activity across the different montages. This systematic arrangement of traditional, virtual and brain source montages yields a completely new perspective that was not available previously during digital EEG review. More details on the montage options for regional sources see below. Press this button to open the montage editor. In the Montage Editor, the montage channels can be viewed, edited and combined to new user-defined montages. Note: You can switch among montages quickly by clicking on the montage push-buttons Rec, Vir, Src, Usr at the top of the main window below the menus. Clicking on the Rec (Vir, Src, Usr) button once switches to the last displayed montage of this category. Clicking again, the popup menu opens to select another montage of this category. BESA Research provides several predefined recorded, virtual and source montages and allows the user to define new montages. User-defined montages are created in the Montage Editor and are stored in binary files. User-defined montage files located in the program subfolder Montages\UserMontages or in the data directory are automatically available from the Montage / User-Defined menu. User-defined montage files located elsewhere can be loaded in the Montage Editor. After loading they are available from the Usr push button too. The Montage menu provides the same functionality as the push buttons described above, plus the option to show additional channels below the current montage. A brief description of the available montages is given below. For more details see chapter Standard Montages in the help chapter "Montage Editor". Press the push button Rec twice or use the menu Montage/Recorded to select a recorded (traditional) montage. In this traditional montage, the available channels of the Std-27 electrode set are displayed against average reference. The average reference is computed for each time point as the mean voltage over the amplitudes of all scalp electrodes that are not bad. If the common reference used for recording is a single electrode and has been specified, it will be included in the computation of the average reference. This is a longitudinal bipolar montage containing two left hemispheric, two right hemispheric and one midline longitudinal row of montage channels. Longitudinal rows are arranged from front to back. Predefined montage channels are only displayed if both the channel and reference are available (i.e. recorded and not bad). The Triple Banana montage is an extended longitudinal bipolar montage. It has an additional inferior row on each side as compared to the Double Banana montage. Predefined montage channels are only displayed if both the channel and reference are available (i.e. recorded and not bad). The Triple Banana montage is not available if less than 2 inferior electrodes are recorded or defined as ‘good’ on each side. The horizontal bipolar montage contains three transversal rows of montage channels. Transversal rows are arranged from left to right or right to left depending on the settings in Options. Predefined montage channels are only displayed if both the channel and reference are available (i.e. recorded and not bad). In the Horizontal Bipolar montage, available midline electrodes are always displayed even if Midline Channels is set to Off in Montage / Options. In this traditional montage, the available left-hemispheric channels of the Std-27 electrode set (except inferior electrodes F9, A1, P9) are displayed against the electrode A1 (or, if A1 is not available, a close channel such as P9 -> T9 -> TP9 -> M1). The available right-hemispheric channels of the Std-27 electrode set (except inferior electrodes F10, A2, P10) are displayed against the electrode A2 (or a close channel such as P10 -> T10 -> TP10 -> M2). The available midline electrodes of the Std-27 electrode set (except Fpz and Oz) are referenced to A1 and A2 (or a close channel), respectively. If neither A1 nor A2 nor any of the close channels are recorded or defined as ‘good’, the A1/A2 Reference montage is not available. In this traditional montage, the available channels of the Std-27 electrode set are displayed against a common ‘viewing reference’. The default viewing reference is Cz. The viewing reference can be changed in the Montage Editor (which can be opened using the EdM button in the control ribbon). Any of the electrodes in the EEG file may be used as viewing reference. Note that the common viewing reference is independent of the common reference used for recording. This montage displays the data as recorded. Note that channels defined as 'bad channels' are shown as a flat grey line. In the other recorded montages, bad channels are not displayed. If the common reference has been defined, it will be displayed as a flat line as well, since Com minus Com equals zero. The label of the common reference is appended to each channel label. In this montage, push buttons appear at the upper right of the EEG window for selecting All channel groups or one of the possible channel groups (Scp = scalp EEG, Pgr = polygraphic, Icr = intracranial, MEG = magnetoencephalographic channels). These buttons and the group buttons above the calibration marks may be used to change conveniently between displays of a few selected channels of one group and all groups and channels. In this montage, the scalp electrodes are displayed in the recording sequence, versus common average reference. The average reference is computed for each time point as the mean voltage over the amplitudes of all scalp electrodes that are not bad. If the common reference is a known single electrode, it will be included in the computation of the average reference. The voltage at the common reference electrode against average reference will be displayed. Note that this is not a flat line! The Original Recording and Original Average Reference montage have the same sequence of electrodes as the original recorded data. The other recorded montages (as well as the virtual montages) are derived from predefined montage lists based on a standard set of 27 electrodes (Std-27) of the international 10-10 electrode system. If the common reference used for recording is a known single electrode and has been specified in Edit/ Channel Configuration, the common reference electrode is regarded as part of the recording electrode set. Predefined montage channels using the common reference can be displayed. The common reference will be included in the computation of the average reference. This is not possible, however, for EEG systems using a combination of electrodes as the common reference. e.g. F3/F4. Note: A predefined recording montage channel is not displayed if either channel or reference are defined as bad in Edit / Bad Channels. Due to missing or bad channels, a predefined recorded montage may be empty. If this is the case, the montage will not be available for selection in the menu. For more details see the help chapter "Montage Editor / Recorded Standard Montages". Press the push button Vir twice or use the menu Montage/Virtual to select a virtual (interpolated) montage. In this montage, the standard 27 interpolated channels are displayed against a computed zero reference. The reference is estimated as the mean voltage over 642 equidistant locations covering the whole head sphere. Voltages are calculated by spherical spline interpolation. According to physics, the voltage integral over the outer surface of the head is zero. By using the mean voltage over the whole head as the reference a close approximation of the true zero reference is obtained. In this montage, the standard 27 interpolated channels are displayed against a virtual average reference. The average reference is computed for each time point as the mean voltage over the interpolated amplitudes of the extended 81 standard virtual scalp electrodes. Since this standard covers inferior electrodes, the 10-10 virtual average reference is not much different from the reference-free montage. In this montage, current source density (Laplacian) for each of the standard 27 interpolated electrodes is displayed. The CSD waveforms and maps are computed as the second spatial derivative by spherical spline interpolation and are implicitly reference-free. Because this method intrinsically uses information from all electrodes, it provides a more accurate estimation of the source current leaving and entering the skull than source derivations using only 3 or 4 neighboring electrodes. This is particularly true for electrodes at the boundary of the electrode array. This is a longitudinal bipolar montage containing two left hemispheric, two right hemispheric and one midline longitudinal row of montage channels. Longitudinal rows are arranged from front to back. All channels are interpolated. The Triple Banana montage is an extended longitudinal bipolar montage. It has an additional inferior row on each side as compared to the Double Banana montage. All channels are interpolated. The horizontal bipolar montage contains three transversal rows of montage channels. Transversal rows are arranged from left to right. All channels are interpolated. In the Horizontal Bipolar montage, available midline electrodes are always displayed even if Midline Channels is set to Off in Montage/Options. In this montage, the left-hemispheric channels of the standard 27 interpolated channels (except for the inferior electrodes F9, A1, P9) are displayed against the interpolated voltage at electrode A1. The right-hemispheric channels of the standard 27 interpolated channels (except inferior electrodes F10, A2, P10) are displayed against the interpolated voltage at electrode A2. The midline electrodes of the standard 27 interpolated channels (except Fpz and Oz) are displayed twice, referenced a) to the interpolated voltage at electrode A1 and b) to the interpolated voltage at electrode A2. The midline channels are only displayed if Midline Channels is set to On in Montage/Options. In this montage, the standard 27 interpolated channels are referenced to a computed virtual linked ears reference. The reference is calculated as the mean voltage of the interpolated amplitudes at A1 and A2 determined by spherical spline interpolation. The calculation of the average potential at the ears balances both sides correctly in contrast to the unknown bias when linking the ears or mastoid electrodes directly. In this montage, the standard 27 interpolated channels are displayed against a common virtual ‘viewing reference’. The default viewing reference is Cz (virtual). The viewing reference can be changed in the Montage Editor (which can be opened using the EdM button in the control ribbon). Any of the extended 81 standard virtual electrodes may be used as viewing reference. In this montage, the extended standard 81 electrode channels are displayed using spherical spline interpolation and the reference-free mode. The reference is estimated as described for the Reference Free montage. This montage yields more detailed spatial information as compared to the reference free 27 channel montage described above. In this montage, current source density (Laplacian) for each of the standard 81 interpolated electrodes is displayed. The CSD is computed as described for the CSD-Laplacian montage. This montage may yield more spatial information than the 27 channel CSD-Laplacian montage described above. Virtual montages estimate the voltage at the idealized locations of the standard 27 (81) electrodes on a sphere using spherical spline interpolation. This method is described in Perrin et al. (Electroenceph. clin. Neurophysiol. 72:184-187, 1989); please see chapter “Mapping/ Spherical Spline Maps” for more details. Using this interpolation, EEG traces can also be displayed for missing or bad electrodes. The use of interpolation is indicated by the keyword ‘virtual’ displayed in the upper left corner of the waveform window above the montage channel labels. In principal, spherical spline interpolation is possible outside the area covered by the recording electrodes. Over the lower half of the head, interpolation benefits greatly from the presence of inferior lateral electrodes (F9, A1, P9, F10, A2, P10). Although only a minimum of 2 separate channels with lower lateral electrodes is required, for example A1/A2 or M1/M2, the use of 6 or 4 inferior lateral electrodes is recommended. For more details regarding virtual montages and virtual electrodes see help chapter Montage Editor / Virtual Standard Montages. Note: If the number of scalp electrodes is less than 12, spline interpolation and interpolated montages cannot be computed. Press the push button Src twice or use the menu Montage/Source to select a pre-defined source montage. These source montages are available for EEG or MEG, except for the Evoked Potentials montages (EEG only). The 25s source montage is based on sources below the standard 25 electrodes of the IFCN (International Federation of Clinical Neurophysiology). The sequence of reasonable compromise between transversal and longitudinal arrangements while an optimal separation of the major regions, i.e. frontal, central, temporal and parietal-occipital, has been achieved. At the same time, easy hemispheric comparison has been enabled. This source montage uses a set of 15 regional sources covering lateral and midline frontal, central and parietal cortex, midline fronto-polar and occipito-polar cortex as well as anterior and posterior temporal lobes bilaterally. It separates the activities of the 15 different brain regions and provides for fast comparison and quantification of the different activities. This source montage displays the radial and tangential activities of the central brain region bilaterally in the first 6 dipole traces. Head schemes illustrate location and orientation of each virtual electrode. The other 13 regional sources separate the source activities arising from the other brain regions. This source montage displays the radial and tangential activities of the frontal brain region bilaterally in the first 6 dipole traces. Head schemes illustrate location and orientation of each virtual electrode. The other 13 regional sources separate the source activities arising from the other brain regions. This source montage displays the radial and tangential activities of the parietal brain region bilaterally in the first 6 dipole traces. Head schemes illustrate location and orientation of each virtual electrode. The other 13 regional sources separate the source activities arising from the other brain regions. This source montage displays the activities of four different aspects of the temporal lobe bilaterally and largely separates them from the radial activities in the other 11 brain regions. There are 4 equivalent dipole sources in each temporal lobe to reveal temporal-basal, polar, antero-lateral and postero-lateral source activities. The basal and polar sources are oriented tangentially, the lateral sources radially. Head schemes illustrate location and orientation of each virtual electrode. The montage TA_Temporal Lobe is equivalent to the montage T-A in previous versions of BESA Research. 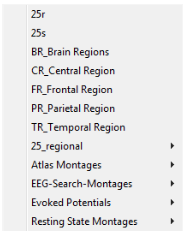 However, the use of the TR_Temporal Region source montage is more recommended because it provides a better separation of the activities of other brain regions. This source montage displays the activities of four different aspects of the temporal lobe bilaterally in the first 8 dipole traces. There are 4 equivalent dipole sources in each temporal lobe to reveal temporal-basal, polar, antero-lateral and postero-lateral source activities. The basal and polar sources are oriented tangentially, the lateral sources radially. The montage TR_Temporal Region separates these 4 aspects of the temporal lobe from the source currents in the other 11 regions irrespective of their orientation. This submenu contains three source montages designed specifically for use with auditory (AEP), somatosensory (SEP), and visual (VEP) evoked data. Brain regions that are specifically relevant for the auditory, somatosensory, and visual pathway, respectively, are modeled with equivalent current dipoles. Remaining brain regions are modeled with regional sources. The Evoked Potentials source montages are available for EEG only. Source montages have been provided which cover the relevant brain regions involved during resting state. BESA Research can transform the scalp EEG into signals of source activity which predominantly reflect the electrical activity of specific regions in the brain. These 'brain source montages' are calculated using specific weighted combinations of the recorded scalp EEG signals. The weights are selected on the basis of multiple dipole models to enhance the activity from one brain region while suppressing the contributions from other brain regions, for example from the contralateral hemisphere. Each new waveform is an optimized linear combination of the measured EEG channels in order to provide a focus onto a particular brain region of interest. On the scalp, the electrical activities of the different brain regions overlap. The brain source montages provide a substantial separation, or deconvolution, of this overlap. Due to the limited number of scalp electrodes, this separation can never be complete. However, separation can be strong enough to make focal activity in the brain visible, by depicting this activity predominantly in the source trace(s) associated with the brain region generating the focal electrical activity. Brain source montages are provided to facilitate the detection of focal source processes in the brain by reversing the overlap from different brain regions seen at the scalp. If brain activity is focal, i.e. represented predominantly in one source waveform, a large amount of the recorded scalp activity reflected in this trace will originate in the related brain region. If source activity is distributed over several traces, the origin is likely to be more widespread or in areas not precisely modeled by the combination of sources in the selected source montage. Each channel in a brain source montage can be viewed as a 'gross virtual electrode' placed onto a particular brain region. Standardized brain source montages are defined for the 81 standard 10-10 electrodes. Therefore, the recording montage is first interpolated onto the 81 standard electrodes. Then the source waveforms are calculated using the source montage file. The standardized source montages are optimized for different brain regions (central, frontal, parietal, temporal). The source montages are composed of dipoles, which predominantly model the activity of the different aspects of the selected brain region, and of regional sources, which largely suppress the source activity arising from other brain regions. The option Midline Channels in Montage/Options may be used to turn on/off midline source channels. A source channel is considered to be midline if abs(x)<0.2, i.e. if it is located at the midsagittal plane or left/right of the midsagittal plane within 20% of the head radius. The regional source display type can be changed in Montage/Options. Note that dipoles are indicated by head symbols if Options/Display/Show Heads in Source Montage is selected while regional sources always have green channel labels. Use the 3D view in the Montage Editor (which can be opened using the EdM button in the control ribbon) to visualize the locations of the dipoles and regional sources in the different source montages or right click on the head symbol/channel label of a source channel to view the brain region and its orientation associated with the selected dipole channel. For a more detailed description of brain source montages see help chapter Montage Editor / Standard Source Montages. Brain source montages show a much better separation of focal brain activities than scalp montages. For example, if we remontage an EEG showing a temporal lobe seizure best in the horizontal bipolar montage (below left) to a brain source montage (below right, montage TR_Temporal Region), focal source activity is visible at the base and at the tip of the right temporal lobe. Due to the limited spatial resolution of the scalp EEG, a small amount of the activity also appears in other source channels. Nevertheless, the largest activity appears at the base and tip of the right temporal lobe as seen in the source channels. The activity is similar to the activity recorded at the sphenoidal electrodes (SP2-T3 & SP1-T4, below right), but the separation between right and left temporal lobe is larger in the source montage. Left: Horizontal bipolar montage of the file eeg2.eeg; Right: TR_Temporal Lobe source montage of the same data segment. The patches of activity shown in color coding in the schematic head views reflect the brain regions onto which the source channels are focused. In other words, each source channel represents a gross 'virtual electrode' placed over the corresponding cortical surface. The size of the patches indicates that the location and extent of the source activity cannot be precisely determined because of the limited spatial resolution. However, the patches reflect a high probability that source activity exists in this brain region provided that one brain region is predominantly active. If multiple patches appear to be active, the distribution of source activity in the brain may be more complex, i.e. more distributed or multifocal, and the distribution has to be interpreted with care. 'Brain source montages' are different from traditional 'source derivations', which subtract the amplitudes of the signal at the adjacent electrodes from the data at a given electrode. Thus, a 'source derivation' shows an approximation of the 'current source density (CSD)' flowing in and out from the skull below a given electrode. BESA Research provides improved 'source derivations' on the basis of 'Laplacian' or current source density montages: CSD-Laplacian and CSD-Laplacian (10-10) montages. In BESA Research, the Laplacian is calculated by spherical spline interpolation. This method provides a more accurate estimate of CSD at any given electrode than the subtraction method using 3-4 surrounding electrodes, especially at the outer electrodes of the scalp electrode array. Note: If the number of scalp electrodes is less than 12, brain source montages cannot be computed. Press the push button Usr twice or use the menu Montage/User-Defined to select a user-defined source montage. User defined montages can be created, edited, saved and reopened in the Montage Editor. For more details see chapter “Montage Editor”. User montages may contain recorded, virtual and source channels, also in combination. The montage can be saved to file in the Montage Editor in binary format. When saving, the user can decide to put the montage into the folder Montages\UserMontages as a generally available montage or into the data folder as a file specific montage. Available user montages are displayed by filename in the Montage/User-Defined popup menu. General user montages (stored in Montages\UserMontages) are displayed above the separator in the menu. File specific user montages (stored in the data directory) are displayed below the separator. The latter montages are only displayed if the corresponding data file is currently displayed. It is recommended to use a naming convention similar to the standard brain source montages: AB_Full Name.mtg. AB is abbreviation, which will appear after the label of each channels, e.g. source montage BR_Brain Regions, 1st montage channel = FL_BR. Press the push button Add at upper right of the review window or use the menu Montage/Additional Channels to select an additional channel montage. A set of additional channels can be displayed along with the current montage channels at the bottom of the screen. This is useful, for example, for displaying ECG and other polygraphic channels, and for comparing depth channels with the scalp EEG. Additional channels may be individually filtered (see online help chapter "Review / Reference /Menus / Filters / Polygraphic / Additional Chns") and scaled. BESA Research ships with a predefined set of additional channel montages which can be selected from the dropdown menu. The corresponding files are stored in the folder Montages\AdditionalChannels. Note that additional channel montages are only available if the labels of the (traditional) additional channels are available or if the (virtual) additional channels can be calculated for the current file. A detailed description of the predefined additional channel montages is given in the section Standard Montages in the help chapter "Montage Editor". Further additional channel montages may be defined and saved to a file in the Montage Editor. They can also be selected from this menu if they are available for the current file. Use this menu, too, to switch off the currently displayed additional channels. A commonly used additional channel file can be assigned in the initialization file BESA.ini (entry AdditionalChannelFile in the section [Defaults]). The additional channels will be displayed automatically if they are available, if the entry AdditionalChannelStatus in BESA.ini is set to On and if there is no other additional channel file assigned via the entries in the program database. Note that this menu can also be conveniently reached from the Add button in the upper right corner of the main window or by a right mouse click on the label of an additional channel. This item selects the sequence of montage channels in recorded (except Original Recording and Original Average Reference montage), virtual and standard brain source montages. If Left to Right is selected (default), montage channels are displayed in a systematic order from left to right. If left to right is not selected, the sequence is reversed from right to left. This option can be combined with Regional Comparison or Hemispheric Comparison. This item selects the grouping of montage channels in recorded (except Original Recording and Original Average Reference montage), virtual and standard brain source montages. If Regional Comparison is selected, channels are grouped regionally to ease regional comparison. Regional Comparison is off by default. Regional Comparison and Hemispheric Comparison cannot be set together. This item selects the grouping of montage channels in recorded (except Original Recording and Original Average Reference montage), virtual and standard brain source montages. If Hemispheric Comparison is selected, channels are grouped pairwise by hemisphere to ease hemispheric comparison. Hemispheric Comparison is off by default. Hemispheric Comparison and Regional Comparison cannot be set together. The option Midline Channels decides if midline channels (recorded, virtual, source) are displayed or not. Note: for recorded and virtual horizontal bipolar montages, midline channels cannot be switched off. Midline Channels are displayed by default (tick marked). If this menu item is selected, the 3 waveforms of a regional source are combined to a single waveform by calculating the maximum PCA component of the 3 waveforms. With this option, the regional source is oriented such that the source waveform depicts most of the variance in the currently displayed data. When paging through the data, the orientation of the source waveform changes depending on the data. Note that this regional source display type also focused on high-amplitude artifacts like blinks and eye movements. If this menu item is selected, only the radially oriented waveform of the 3 regional source waveforms is displayed. Note that source waveforms will be small if source activity in the associated brain region is not oriented radially. For MEG, this menu item is grayed. If this menu item is selected, all 3 waveforms of a regional source are displayed, one below the other. The 1st waveform is oriented radially (pointing inwards), the 2nd waveform is oriented vertically (orthogonal to 1st, pointing upwards), the 3rd waveform is oriented horizontally (orthogonal to 1st and 2nd, pointing forward or from right to left if the source lies in the sagittal plane). For MEG, only 2 waveforms are displayed. Both depict activity in the plane tangential to the location of the regional source. If this menu item is selected, the 3 waveforms of the regional source are combined to a single waveform by calculating the root mean square magnitude of the 3 waveforms. All montages can be displayed in 6 different systematic orders: Left to Right, Right to Left, Left to Right (or Right to Left) + Hemispheric Comparison, Left to Right (or Right to Left) + Regional Comparison. Select Montage / Options to set the montage order. If Midline Channels is On in Montage / Options, available midline electrodes are displayed (from Fpz to Oz) in the sequences Left to Right, Right to Left or Regional Comparison. They are not displayed when Hemispheric Comparison is On. In the Horizontal Bipolar montage, available midline electrodes are always displayed. Montage channels are systematically colored in BESA Research. Left channels are displayed in dark blue, right channels in dark red. Midline channels are displayed in black. A recorded or virtual montage channel is considered to be midline if channel and reference are at the midline (e.g. Fz-Fcz) or if the reference has no side (e.g. Fz-avr). If the channel is midline but the reference is on the left (right) side, e.g. Fz-A1 (Fz-A2), the montage channel is considered as left (right)-sided, i.e. it is colored in dark blue (red). The same rule applies if the reference is midline but the channel is on the left (right) side, i.e. Fp1-Cz (Fp2-Cz) is displayed in dark blue (red). In source montages, left channels are displayed in dark blue, right channels in dark red. Midline channels are also displayed in black. A source channel is considered to be midline if abs(x)<0.2, i.e. if it is located in the sagittal plane or left/right of the sagittal plane within 20% of the head radius. The scaling of amplitudes and time intervals is performed using the buttons which are grouped at the righthand side of the waveform display. The displayed time can be scaled by clicking the Timing button at the bottom right of the display. The button shows the time interval displayed on the screen. Pressing the button opens the Timing dialog box where epochs between 0.1 s and 60 s can be selected. The controls at the top right of the window allow to display All channels of the recording montage or to toggle between subgroups of channels (Scp = scalp, Icr = intracranial, Pgr = polygraphic, MEG). Click on the Add button to display additional channels below the recorded channels. A popup menu appears from which you can choose sets of additional channels. For example, if you choose 'EOG_HV', two virtual eye channels, horizontal and vertical, are calculated from the data and displayed. For each channel group, there are two controls at the right side of the window. The upper one controls the subset of channels which is displayed, the lower one controls the scaling. To select a subset of a channel group for display, click on the upper of the two buttons. It shows the number of channels which are currently shown, and the total number of channels in that channel group (e.g. Scp, 32/32). In the dialog box that appears, you can make a fast selection using one of the buttons, or make a precise selection using the rulers. The lower of the two buttons for each channel group controls the amplitude scaling. The scaling bar between the buttons shows the scale of the current value, which is shown on the button. To change, for example, the scaling of the EEG channels to 100 µV, click on the lower button of the 'Scp' channel group, and select 100 µV in the dialog box that appears. For more details about timing, scaling and channel selection controls see the online help chapter "Review / Reference / Controls / Timing, Scaling, and Channel Selection". The digital filters in BESA Research are used in addition to the filters set during recording of the digital EEG. It is therefore useful to record the EEG with the largest bandwidth compatible with the sampling rate (e.g. 70 Hz high cutoff at 200 Hz sampling rate), and to use the digital filters in BESA Research to suppress unwanted low and high frequency noise during review, or to enhance the resolution of a periodic pattern by setting the band-pass filter around the frequency of interest. When a data file is first opened, the filter settings as defined in the initialization file (BESA.ini) are used. The LF button opens a popup menu with the available settings for the low cutoff filter. You can choose between time-constant filters and variable filters, where different filter types can be selected (forward, backward, zero phase shift), as well as the slope. The popup menu for the HF button provides a selection of frequently used high cutoff filters. Again, it is also possible to use the option 'Variable High Cutoff Filter', where frequency, type, and slope can be selected freely. A notch filter for suppression of noise in narrow frequency bands is available from the NF button. Click the button to choose between 50 Hz or 60 Hz suppression. The EdF button starts the dialog box to edit the variable filter settings and to select special band pass and notch filter settings. In the Filter menu, further commands are available to view the filter response with the current settings, and to adjust baseline settings. In the Filter menu, it is also possible to apply special filtering to polygraphic and additional channels. For more details see the online help chapter "Review / Reference / Menus / Filters". The red box indicates the dragging interval and selected channel. The popup window shows the channel label and the measured values for negative peak, positive peak, peak-to-peak amplitude difference, and frequency. If no frequency dominates inside the interval, the frequency is classified as undefined. To display the amplitude of a channel at a certain time point, place the mouse cursor over the point of interest. The corresponding amplitude will be displayed in the status bar at the bottom of the BESA Research main window. Correlation analysis provides information about the similarity, relative amplitudes and time delays between one reference channel and the other concurrent waveforms. Using source montages, it can give valuable information about the relationships among the activities of different brain regions. For example, we may want to measure whether a certain pattern in one brain region appears with some time lag and a certain similarity in shape in a different brain region. We can measure the relationship by correlating a segment of interest in a selected channel with all the other channels. BESA Research provides linear and non-linear regression methods (Pijn 1990). These methods can be applied to any montage, but they are most meaningful with source or intracranial waveforms, since scalp waveforms can pick up activity from remote brain regions due to volume conduction effects. When a block of EEG data is marked, you can click the right mouse button and select Linear Correlation from the popup menu. By selecting the menu item Process / Nonlinear Regression, the non-linear regression is calculated for the marked block. When Linear Correlation is selected, BESA Research computes a correlation function between a reference channel and all the displayed channels, including the reference channel (= autocorrelation). If no specific channel is selected, the channel with the largest signal over the marked block is used as the reference for computing the correlation functions. You may select a different reference channel by clicking on the label or head symbol at the left of the desired reference channel waveform. The correlation window is immediately updated if a new channel is selected as reference. Correlation is calculated by shifting the reference channel by 30 data sampling points in both directions relative to the other channels. At each shifted point (total 61 points) one value of the correlation function is computed. The squared correlation functions are displayed as waveforms in the correlation window, and their maxima are used to define the time lag or lead of each channel with respect to the reference channel. A block is marked by holding the left mouse button down to drag over a portion of the EEG in order to mark a specific pattern, or by right-clicking on a peak latency of interest, and selecting “Default block” from the popup menu that appears. If you use the right-click, the default epoch will be marked around the current cursor. The default epoch can be set using the menu Edit / Default Block Epoch. To compute non-linear correlation, use the menu Process / Nonlinear Correlation. The computation of non-linear regression may be slow if the marked epoch is long. You may type any key to stop computing. Press <Space> to remove the block marking or the cursor. Press <Space> again to continue paging through the EEG. The squared linear correlation function r², or the non-linear regression coefficient h². The pattern of the marked/largest channel is shifted forward and backward by 30 samples (corresponding to a time lag of ± 150 ms at a sampling rate of 200 Hz). The relative value of the maximum signal amplitude in the various channels (amp). 100% is assigned to the amplitude of the largest scalp/source montage channel. Normally, 100% is assigned to the reference channel unless a polygraphic or intracranial channel was used as reference. The maximum of the squared correlation coefficient r² or h² (c[%]; 0 - 100%). The time lag (positive) or lead (negative) of the maximum of the correlation function relative to the reference channel in milliseconds (lag). BESA Research offers several possibilities to search for similar events or patterns in the EEG and to average them. Pattern search is initiated by marking a specific block, e.g. from 200 ms before a sharp wave until the following trough, to define a template over one or more selected channels or all displayed channels (spatio-temporal search). Then you decide over which range (whole EEG, between markers etc.) the search will be conducted and which of the pattern tags shall be used. Patterns are detected and tagged automatically, if their correlation with the template exceeds a predefined threshold and if the amplitudes are below artifact threshold or if artifact detection is set to off during search. The correlation threshold and the rejection threshold for artifacts can be adjusted in the menu Search/Options (for more details, see online help chapter "Review / Reference / Menus / Search"). Pattern search: uses the signal pattern template in a selected channel or the spatio-temporal pattern over the marked epoch and several marked channels or all displayed channels to search for similar events. Spatio-temporal search over all channels: This search type is the default. All channels which are displayed on the screen are used. Search for the pattern of one or several specific channels: Mark the channel(s) to be used for the template with a left mouse click on its label (hold down the Ctrl-key to mark more than one channel; cf. section "Using the Mouse"). for Pattern Search set correlation threshold in Search / Options to approx. 80-85%, if using a single channel template, and to 70-75%, if using a spatio-temporal template with several channels. Note that even though the search is performed with the template data block size, BESA Research always uses the settings of the Default Block Epoch (set using the Edit menu) to define the length of the average buffer. the button SAW (Search-Average-Write) on the control ribbon is pressed. If you start reviewing from a patient data base that connects to BESA Research, simply select the recordings you want to review and press the BESA Research icon to open the files. Otherwise, you may open a data file directly from the menu File / Open. This uses a standard Windows File Open dialog that is enhanced by an extra selection box for fast switching between frequently used data folders. The only special aspect to note is the name extension of the type of data that your own EEG system generates: files are displayed using filters that only show names with particular extensions. These are selected using the dropdown list under "Files of type:". The most commonly used file extensions are summarized under the file type "EEG files". Depending on your EEG system, you may have to switch to a different file type (by selecting one of the entries in the list) the first time you use BESA Research. Your file type setting is remembered for the next time you open a data file. By holding down the Shift or the Ctrl key you can select several files. BESA Research allows to open several data files at once. You can switch among the opened files using the file list in the File Menu or the F+ and -F buttons. When a file is closed, the most recently used display settings (filter, no. of secs in the display, etc.) are saved in the database, and restored the next time the file is opened. The Recent File List (Menu File/Recent Files...) can be used to open recent files. Note also that the files from the previous session can be opened using File/Recent Files.../Open All Files from Previous Session. A keyboard short-cut for this operation is to hold down the Ctrl key and press the -F button. When BESA Research is started, and no data files have been opened, pressing -F will open the most recent file. If only one file is open, pressing the button again will open the second most recent file. Data comes in a variety of file formats. Several data formats are controlled by Reader Dlls that are located in the System \ Readers subdirectory of the BESA Research installation. Some readers, although supported, are not installed by default. They can be installed by navigating to the Utilities \ Additional Readers subdirectory of the BESA Research installation with the Windows Explorer, and double-clicking on Install Additional Readers.htm. Here you will find a list of additional readers, and a link to install each reader. In order to map the data, for source analysis or to transform to virtual montages or source montages, the correct electrode labels or the electrode positions on the head must be known. In the case of MEG, fiducials and, preferentially, additional surface points on the head must be digitized. This information is often not supplied or is incomplete in the original data, although it is strongly recommended to define the correct names and electrode labels to all recording channels during acquisition. For the case that the channel information is not provided adequately or erroneous, different mechanisms are supplied to enable you to redefine the channel assignment or to read in the required information. Configuration / Advanced. Make sure that you check the correct relative location of deviating electrodes using the 3D whole head maps. More advanced electrode location information is provided with a 3D digitizer. See online help chapter "Special Topics / Working with Electrodes" for a more detailed description how to read digitizer coordinates and other 3D locations (e.g. for MEG). File / Load Channel Configuration: Loads a file containing a predefined configuration. File / Head Surface Points and Sensors / Load Coordinate Files (CTRL-L): Opens a dialog allowing to select channel configurations and digitized coordinates. This dialog is opened automatically when you open a file for the first time and important information is missing. For more details, see help chapter "Special Topics / Working with Electrodes ... / Working with Auxiliary Files". For the rules about when this dialog is opened automatically, see help chapter "Special Topics / Working with Electrodes... / General Reading Rules for Data Files and Auxiliary Files". Caveat: It is important to check the labels and sequence of channels in the original recorded montage (Montage/Recorded/Original Recording) to make sure that the recording electrode configuration has been correctly protocoled and read from the file header. There may be EEG systems which do not provide this information correctly. Errors may also occur if this information has been entered incorrectly into the recording software. In these cases, you may want to read an electrode file from disk containing your standard or some specific electrode configuration. Such configurations can be edited and stored on disk using the Edit / Channel Configuration menu. It is strongly recommended that you read the Electrodes section in the help chapter "Special Topics" carefully, to make sure that each EEG is associated with the correct labels and sequence of channels, and that the common reference is correctly defined. Otherwise, maps, source images and source montages may be incorrect, and source analysis cannot work properly.